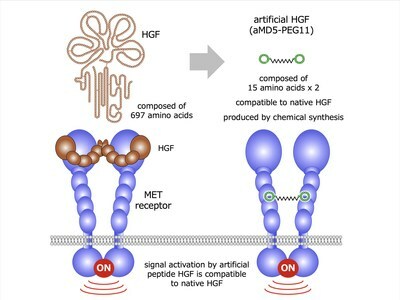 To mimic the actions of HGF, the researchers created a 'macrocyclic peptide' molecule (named aMD5-PEG11) which activates the MET receptor (Main Fig). This molecule is composed of chemically cross-linked two macrocyclic peptides. Such cyclic molecules are flexible in structure and can bind and activate MET. Furthermore, aMD5-PEG11 docked onto to a different region of MET than HGF, aMD-PEG11 and HGF therefore did not directly compete for MET and nullify each other's effects. Whether aMD-PEG11 also induced these structural changes, was then assessed in two different human cell types. aMD-PEG11 induced the same extent of coupling/dimerization and phosphorylation of the MET receptor in a comparable ability to HGF. Several growth factors have been used as biological drugs manufactured by recombinant protein production. This study reported a synthetic artificial ligand that induced chemical and biological effects equivalent to a natural ligand. Not only are artificial ligands relatively cheaper to produce, but often their smaller size leads to greater permeability in the body. "Artificial MET receptor agonists such as macrocyclic peptides have the potential to be developed as novel biological drugs manufactured by chemical synthesis," concludes the team. Besides growth factors, this strategy can be applied to many kinds of ligands. Ligands and receptors: Ligands are molecules in the cell that specifically but reversibly bind to another molecule, known as its receptor. This binding of the two is the important first step in the activation of a series of pathways, responsible for a biological response. Ligands usually induce chemical/structural changes on the receptors subsequent to binding. Common examples of ligands are enzymes, neurotransmitters, hormones and growth factors. Synthesizing drugs that mimic ligands and bind to specific receptors is a common strategy in medicine to stimulate the activation of biological pathways. Wenyu Miao, Katsuya Sakai, Naoya Ozawa, Takumi Nishiuchi, Yoshinori Suzuki, Kenichiro Ito, Tomomi Morioka, Masataka Umitsu, Junichi Takagi, Hiroaki Suga and Kunio Matsumoto. Cellular signaling and gene expression profiles evoked by a bivalent macrocyclic peptide that serves as an artificial MET receptor agonist. Scientific Reports, 07 November 2018. HGF (Hepatocyte Growth Factor) is a bioactive protein which exerts biological activities through the binding and activation of the MET transmembrane receptor. The extracellular binding of HGF to MET receptor induces association of two MET receptors (called "dimerization"), thereby the MET receptor can be activated. 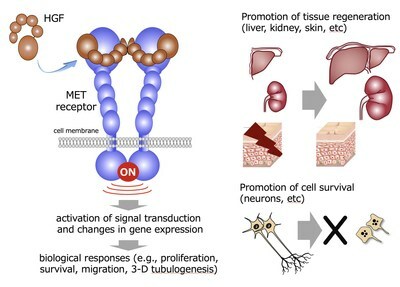 Activation of the MET receptor results in biological responses of cells, including cell proliferation, migration, survival, and 3-D tubulogenesis/morphogenesis. Because of these multiple biological activities, HGF supports regeneration of tissues and phase-II clinical trials recombinant HGF protein for treatment of patients with spinal cord injury and amyotrophic lateral sclerosis (ALS) are ongoing. HGF is composed of 697 amino acids and manufactured by recombinant protein technology as a biological drug. The authors discovered artificial HGF composed of chemically linked two cyclic peptides (aMD5-PEG11). This artificial peptide HGF can bind and activate MET receptor, in a comparable ability to HGF, a native ligand for MET receptor. Because artificial peptide HGF has biological activities compatible to HGF and it can be manufactured by chemical synthesis that can be manufactured at much lower cost compared to recombinant protein production, artificial peptide HGF is expected to be a next-generation biological drug manufactured by chemical synthesis. Moreover, the technology used to discover artificial peptide HGF can be fundamental technology for discovery of artificial peptide cytokines and growth factors for medical application.